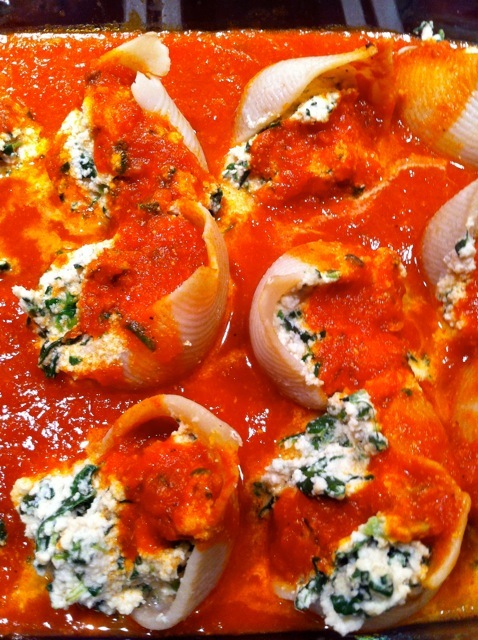 Lisa Dawn’s Vegan Stuffed Shells with Cashew Ricotta Cheese!! I am super excited about having my amazing friend Lisa Dawn Guest Blog!! She has just started her own fabulous blog, Lisa’s Project:Vegan with deelish vegan recipes which almost all take less than a half hour to make! She was the inspiration behind the Coconut Lentil Soup, which if you tried I know you loved! The Vegan Stuffed Shells with Cashew Ricotta Cheese below looks out of this world. I know I will be making this soon myself!! Thanks Lisa! 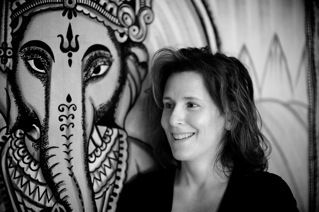 About Lisa Dawn: I am a vegan mom and wife and I love to cook. I became vegan over four years ago for several reasons – the health and welfare of the animals, myself, and that of the world. My husband has been vegan since he was a teenager and together we are raising our son vegan. It is a challenge to do so in this world but it makes it that much more fun to be creative and to cook delicious meals that people really enjoy. Everyone who joins us for a meal leaves fully satisfied and with a handful of recipes! My cashew ricotta cheese is outstanding and I use it in a lot of dishes. But nothing beats stuffed shells! You can vary the filling (e.g., you can use butternut squash or just plain cashew ricotta). My family loves it! It is not as hard as you think to make this and it is very satisfying! Soak cashews overnight. In the morning, drain them and then place 1 cup at a time into the in the food processor. Process the nuts until fine and then add 3/4 cup of water, a pinch of salt, a pinch of nutmeg, and a dash of lemon juice. Process and then place in strainer (with very small mesh) over a bowl to drain excess water. Repeat until you finish all of the cashews. Let this strain for a few hours. The top might get slightly hard but don’t worry, just mix it back in. When it seems like all the excess water has drained out, place in a container and use it when ready. Preheat oven to 350. Boil up shells according to package directions. Use lots of salt in the water to season the pasta. While they are boiling, place frozen spinach in small pot with a little water and set on a high flame to defrost quickly or do this ahead of time. Either way, make sure you drain all of the water out. Mix the spinach with the cashew ricotta. Add some garlic powder and mix. Taste it and decide if you want any more seasoning, e.g., salt and pepper. Coat the bottom of a baking dish with tomato sauce. When the shells are done, carefully strain them. Assemble your shells by stuffing them with the mixture and placing them into the baking dish. Pour tomato sauce in between and around the shells. Place in the oven for 15 to 20 minutes so they are thoroughly heated through. This looks great. I shall try this for my daughter who loves past. Do you use raw or roasted cashews? raw cashews 🙂 let me know what you think, it is the best “cheeze” ever!!! Sounds deelish! How did you make the chive ricotta cashew filling? Made these tonight! Awesome!!! I added 1 Tb of nutritional yeast to the filling and since I’m not vegan I added some browned ground chicken to the sauce. This recipe filled about 20-22 pasta shells and filled a 9×13 pan. I covered the pan with foil while baking. This was so much like the real cheese version it was amazing! It’s been years since I’ve been able to enjoy this dish! Thanks for posting! Awesome Melissa, SO happy you enjoyed this! The “cheese” is amazing and sooo versatile too!! !